The days are slowly becoming shorter and one by one the leaves are turning golden. Yes, summer is coming to end and autumn is here to replace it. You can forget about the hot summer days and embrace the brisker season ahead. Prepare yourself for heavier fabrics, deeper earthy tones, and a lot of layering. Other than the obvious swaps such as shorts for pants and jeans, t-shirts for knitted sweaters, and cotton for cozy wool, you must consider swapping your formal business attire too such as the linen and seersucker suits with equally stylish yet warmer ones. The fabric of your suit will make all the difference when the cold and windy season is here but at the same time, you will need to remain sharp and stylish. How to Create a Men's Suit Outfit? To start, you need to begin with the basics. In order to do so, you need to think and create the overall suit-up look in your head. What does this mean? You should think about the lifestyle that you have and how often do you actually wear a suit. Do you need to suit up for work? Or maybe for a wedding? Or maybe a simple date night? Once you have pictured your combination in your head and you know what you are looking for, you need to consider your budget. Think about the amount of money that you are able to spend on a decent looking suit. It might help and put things in perspective if you see the entire process of buying of a suit as an investment. If you are planning on wearing this suit more than once rather than just for your brother`s wedding, than you should consider purchasing a more expensive and high-quality suit that it`s durable and “fits you like a glove”. 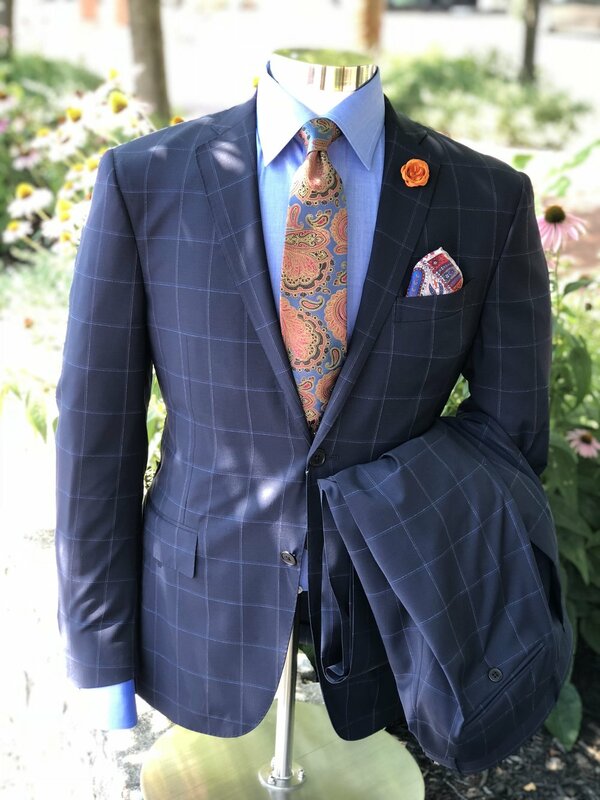 Nevertheless, if you have already bought a suit or two or this is the first time, you can definitely rely on the team where you are purchasing the suit, since they have probably worked with a lot of people, and different body types, they are indeed perceptive with an extraordinarily sharp eye for fashion. Most of the stores employ an in-store stylist that is here to point out which suit will work best for you and which will not. Fall colors tend to be underestimated when compared to their opponents-the fresh pastels. But, don’t be fooled, they can offer so much more! Prepare yourself to dive into the depths of the rich and subdued autumn colors. Draw your inspiration from the nature that is going through a change of its own. Don’t be afraid to experiment and play with the colors, choose something more risky and unique such as deep burgundy red, darker golden shades of yellow, emerald green, and the classical all-time-favorite brown. If you are playing more on the safe side you can never go wrong with purchasing a gray suit, navy, or black one. But always have the tendency to stand out from the crowd rather than blend in. Be yourself, show your true personality. Look and feel good in your skin! Sometimes, other than being playful with the color of your suit, you can experiment with some patterns too. Wearing checks or plaids on your blazer is the perfect way to make a statement and to add a dose of individuality to your overall combination. One of the crucial things, when you have already chosen your suit`s pattern and color, is to decide the type of the suit. There are two types that are most common: the single-breasted jacket, and the double-breasted jacket. The first one is the ultimate classic and a safe choice with which you can`t go wrong, and the second type is more unique and elegant. If you go with the first option, the next step is figuring out the appropriate button stance. Most of the modern suits today come with two-buttons (additional tip-always keep the bottom button open). Don’t even think about ignoring the back of the jacket since it does play an integral role in the suit`s character. You can choose between the modern double vent jacket and the classic single vent jacket. The last important thing that plays an essential role in addition to a men`s suit are the pockets. The most common pockets are the flap ones with classical rectangular flap over the front of the pocket. Additionally, there is the three-piece suit, but be careful with it, you don`t want to look like wearing a costume. As we have previously mentioned, the cooler months demand to put away your linen suits back in your closet and focus on textures and fabrics that will keep you warm. The fabric is one of the two both equally important key factors that determine the suit`s quality, the first being its construction. High-quality fabric will feel better on your skin, look better and hold its shape for a longer period of time. In fall you want some medium weight cloth that will keep you warm and cozy during the chilly days. Most fall suitable fabrics are wool, flannel, and cashmere. All of them have a texture suitable for the unpredictable fall weather conditions. If you are living in an area that tends to get a bit colder consider purchasing suit that is half or fully-lined. This will make all the difference in retaining warmth and resisting wrinkling. There are a few tips that make all the difference between looking sharp and elegant and on the contrary looking like you are “swimming” in it. Although the carefully selected team of professionals in almost every store might help you to find the perfect suit, you might just know these tips yourself and keep them in mind when you are purchasing your new suit. Starting from the top, the first thing that matters is the collar of the suit. The collar shouldn’t be too tight or be too wide but much rather it should fit snugly against your neck. The shoulder seam on top should hang slightly over your bone on your shoulder to enable you to move freely and give you an overall broader look. Aim for a smooth look. Avoid looking like a football player hence of oversized puddles on the shoulders and in contrast, try avoiding extremely tight suits that will limit your movement and make you feel uncomfortable. The easiest way to recognize if the upper part of your suit-the jacket fits you ideally is to look for straight and flat lapels when you button it. Despite it might sound funny, having the right width of the armholes can “make or break” your suit. Too big and you are risking to move the entire jacket with every movement, too small and you will encounter wrinkled sleeves. It is a well-known and timeless rule among gents that the jacket should cover your bum. Although you should follow this rule, you shouldn’t follow it blindly. The jacket should fit you accordingly to your entire height and your pants. The winning combination for your sleeves is for them to be without any wrinkles and to have the proper length. Approximately, when you bend your wrist with your palms facing the ground, they should be about ¼ above the top of your hand. This will enable you to move freely, reach out for distant objects while at the same time maintaining the proper sleeves length. Aside from the jacket, your dress pants should fit you flawlessly too. They shouldn’t be too baggy nor tight but on the contrary, they should have clean lines, no wrinkles, comfortably complimenting your overall combination. Visiting your local tailor is the last but not least important step in the process of creating the flawless suit-up overall look. In the world of fashion and style, the fit is everything. Making small yet vital adjustments might just be the thing you need in order to achieve the custom-made look. Most commonly seen problems are: the sleeves being too long, the length and the appropriate sizing of the trousers/ pants, too wide waistline, holes rips and tears made by accident, and replacement of buttons and zippers. After you`ve purchased the suit, the next big thing is choosing the proper dress shirt. Although this might not sound important to you, choosing the adequate dress shirt is the key to creating a superior stylish combination. The dress shirt characterizes with long sleeves, collar, full button-up, and wrist cuffs. Finding the perfect dress shirt can be a bit of a challenge since it should fit you well, be comfortable, it shouldn’t restrict your movements, and on top of this, it should look amazing. There are a few key things that you should know when purchasing a dress shirt that will go hand in hand with your suit. To begin with, you must aim to purchase a dress shirt that will fit you properly, flatter your body shape and one that will make you feel comfortable all day long. It is the fundamental rule followed by millions of gents, businessmen, and fashion-aware men. This is more easily said than done when you face the endless variety of dress shirts. Starting with the most commonly seen types of standard fits, you will be able to choose between: the slim fit, the normal fit, and the loose fit. Trying out will do the trick just fine. Don’t be afraid to see and feel for yourself rather than blindly purchasing your dress shirts. Once you put it on, you will know. You will know how you look, and most importantly how you feel. The space between your neck and the shirt collar shouldn’t be bigger than two fingers to slide through. The dress shirt should end just at the spot where your shoulders meet your arms, nothing more nor less than that. The armholes should be wide enough to enable you to move freely. The sleeves should follow the natural line of your arms, nothing too billowy nor tight. The sleeves should end where your palms meet your wrists. The dress shirt`s fabric is just as vital as choosing the right fit or maybe even more. The fabric itself can set the tone of your entire combination hence why it is important to know all the different types of fabric. Cotton is the most common material and the irreplaceable king among shirt fabrics. It is a lightweight breathable fabric that will feel smooth against your skin. It can be combined with both formal and casual combinations depending on its blend. Man-made fiber is a more affordable option when you are looking for to replace the fine cotton. They are not as quality as the cotton but the form of polyester, nylon, etc. can create stain-resistant, and wrinkleless shirts. Linen is the supreme material for the hot summer days. This light and breathable fabric will be miraculous for the long days at work when you must wear a long-sleeved dress shirt. Silk is a luxury fabric easily distinguishable hence of its smooth, sheen, and drape texture. You might think that the collar itself doesn’t play such a big role, but on the contrary, it enhances your facial features and frames your face. Choose between some of the most popular collars such as the spread collar, widespread collar, wing tip, classic collar, button-down collar, and the band collar. Although the cuffs of the sleeves won`t be even fully seen when you are wearing the jacket, you know it already, the details are what truly matters. Some of the most practical and popular options to choose from are the button cuffs, the barrel, and the French ones. Since we`ve started with giving you directions on how to experiment with purchasing a bit more color- unique and stylish suit than you should know that your dress shirt should remain simple and one-colored. After all, you don`t want to look like an exotic bird, do you? Think about the compatibility of it with the rest of your outfit, does it enhance it, does is shows your true personality? If you lack the inspiration of what to choose, you can always turn to the safe and timeless options such as the solid white or blue that will sort off open up the entire combination. This is the ultimate never-changing rule that you have probably heard off. If you want to look sophisticated than you should aspire your dress shoes to match your belt. Accordingly, if you are wearing classical and super-formal Oxford dress shoes than you should be wearing a wide black leather belt too, or if you are wearing more casual dress shoes such as the Loafers in neutral earthy tone, for instance, brown than your belt should be brown too. As simple as it sounds, at the same time when you are buying shoes, buy the matching belt too. Sometimes you get so caught up in the process of choosing and purchasing the right suit and accordingly the appropriate dress shirt that you might forget about important details such as the accessories. The attention to details will make you stand out from the crowd as a stylish person committed to details. Here are the top accessories that you need to pay attention to in order to complete your formal look. If you are aiming to create an elevated and superior formal look than you shouldn’t forget about wearing a tie too. The tie will allow you to keep the elegant look even when you take the jacket off. There are two types of ties: the traditional and the bowtie. If you consider yourself a more classical lad or you will go to a more formal event thus you want to keep things simple, then the traditional tie is the right way to go. On the contrary, if you want to add a dose of individuality and uniqueness than the bowtie might just do the trick. However, don’t be fooled by its funky patterns and prints, the bowtie holds its reputation as being constantly worn with tuxedos and therefore being even more elegant than the traditional tie. If you are not in particularly excited by the whole “tie” thing, then you will find that the ascot can be a great substitute. They are considered as being a more casual accessory when compared to the traditional tie and the bowtie. Choose a colorful ascot and wrap it casually around your neck to add a subtle dose of chicness. Having a pocket square is a great way to present another stylish layer of yourself. It can be a great way to create an almost unnoticeable mix and match between your tie and the pocket square. Despite being the smallest suit accessory, its size doesn’t decrease its importance. Wearing a lapel pin is a simple and cost-effective way to add a certain dose of edginess and customize your formal attire. You can see! Nothing scary in creating a perfect suit combination for the fall that is yet to come. A few easy steps to follow and a couple of tips and tricks to keep on your mind, and you are good to go, ready for a shopping. Don’t be scared by the number of options that you might run into. Yes, there are plenty of them but don’t be intimidated. Take a chance and create something unique. Something that will not only look good, but it will make you feel good too. Choose to trust your instincts because after all, there is not a single person out there that knows you better than you know yourself! Yes, small assistance can be helpful in terms of choosing the right fit, the right length, and the type of fabric. 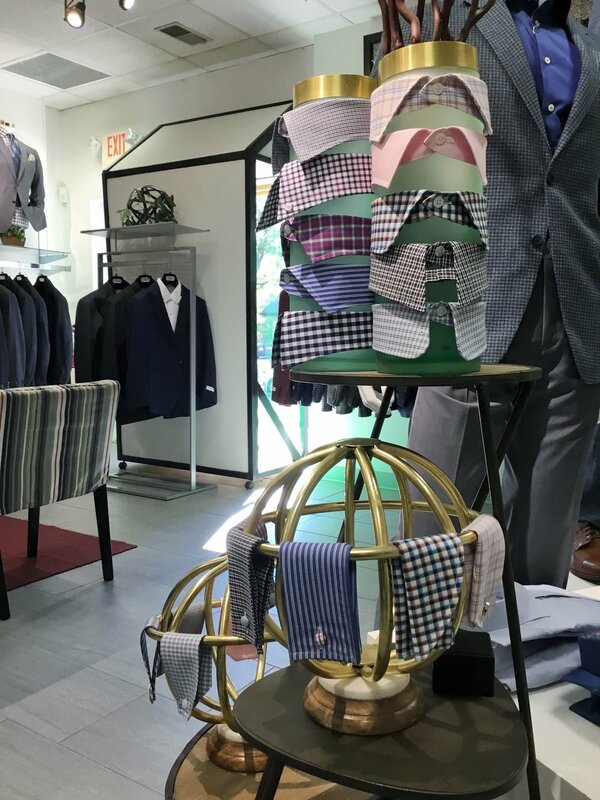 If you don’t know where to start or you need an extra hand and professional opinion than you might make a stop to the Blaine’s Fine Men’s Apparel in downtown, Montgomery, Ohio. Not only they have a carefully-selected team to help you with every single decision, but they also have a variety of formal attire options such as suits, dress shirts, bow ties, and even custom suits.